Every week, I scour the web to find inspiring outfits on your favorite celebs and help you recreate their looks! This week, I was inspired by Alessandra Ambrosio, Sarah Hyland, and Poppy Delevingne, who all wore denim jackets recently. Read on to see how you can get their looks for yourself. Alessandra Ambrosio was one of the many celebs to rock colorful stripes this past week. In her laid-back look perfect for spring, Alessandra wore a multicolor striped sweater with some white ankle cropped jeans and pair of gray low-top sneakers. She also wore some beige frame sunglasses which complemented the muted pastel hues of her sweater. Whether you’re running errands, going to a casual brunch, or just hanging out with friends, copy Alessandra’s ensemble for the right balance of trendy yet laid-back. 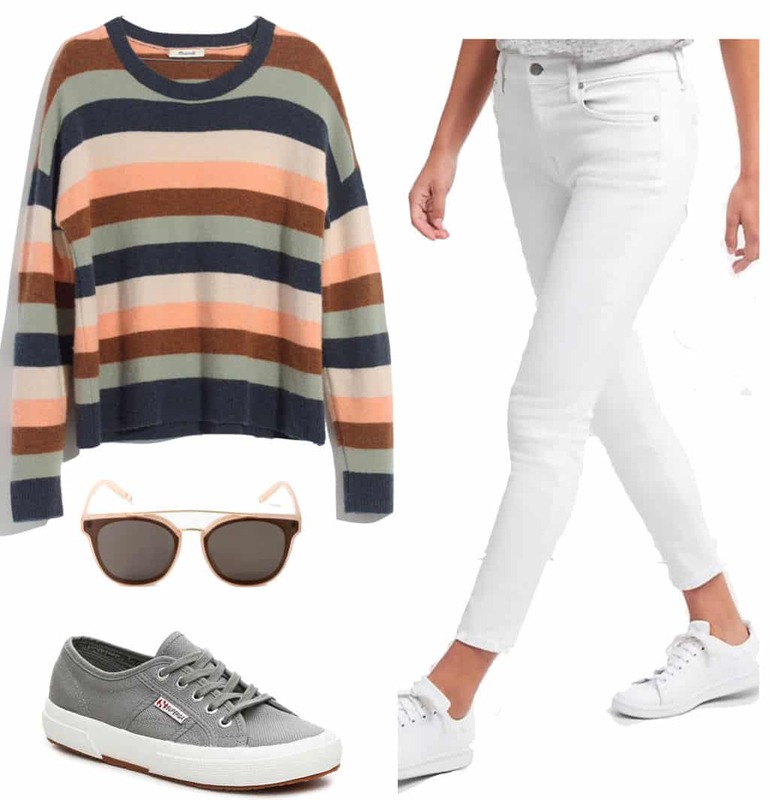 Break out your white slim fitting jeans (opt for a cropped ankle length) and pair them with a multicolored striped crewneck sweater. This sweater features a more subdued color scheme similar to Alessandra’s. Keep the look simple and comfy by wearing some gray low-top sneakers and a fun pair of sunglasses with beige frames. Modern Family actress Sarah Hyland headed to a friend’s house in a cute, ’70s-inspired outfit. Sarah wore a rainbow colored striped off-the-shoulder top with a brown button-front corduroy mini skirt, along with some short black ankle booties. In keeping with her retro vibe, she accessorized with hoop earrings and round sunglasses. 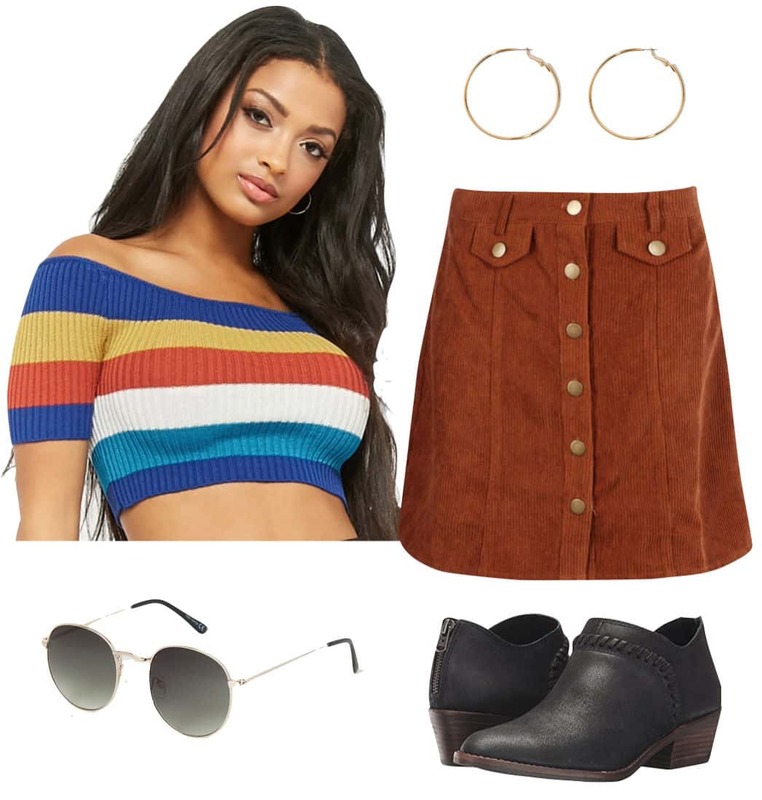 Channel the ’70s with Sarah’s retro-inspired ensemble. Wear a colorfully striped off-the-shoulder top with a brown button-front cord mini skirt and some black ankle booties. This pair has a short shaft similar to Sarah’s booties. For extra vintage-inspired flair, wear some hoop earrings and round sunnies. Actress and model Poppy Delevingne traveled in style – and in stripes, of course! While recently at LAX airport, Poppy wore a yellow and white striped blazer over a simple white t-shirt and blue skinny jeans, giving her outfit a more polished look. She accessorized with functional pieces like a large brown tote bag and some white low-top sneakers. Poppy’s look starts with a basic white t-shirt and some blue skinny or slim leg jeans, along with some white low-top sneakers. Super simple, right? Give the ensemble instant polish by wearing a blazer over top; this yellow and white striped blazer is a great dupe for Poppy’s, and gives the outfit a fun, youthful look. Bring it all together with a oversized brown faux leather tote bag, which is both functional and chic.